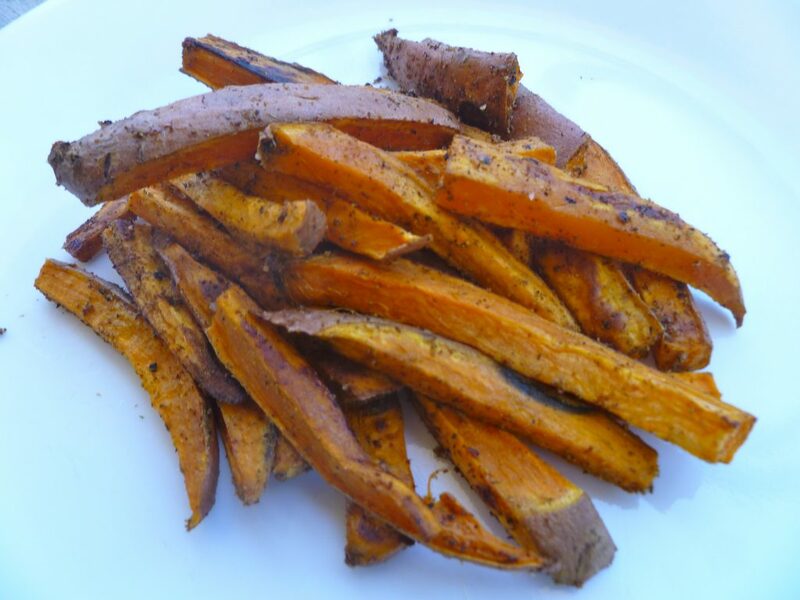 Sweet potato fries can be a healthy side if you make them that way, but beware of sweet potato fries from restaurants or fast food chains. Often, they are fried in the same oil and grease as the regular fries! Make sure to ask how they are prepared (look for baked or roasted) or use this simple recipe at home. Sweet potatoes are an excellent source of calcium, vitamins A and C, potassium, fiber and beta-carotene. Make sure to leave the skin on when baking– that’s where all the fiber is! 1. Preheat oven to 425 degrees. Rinse the potato well and cut into thin strips. 2. In a large bowl or mix together the spices and olive oil. Toss in the potatoes and coat with spice mixture (you could also do this in a large plastic bag). 3. Place potatoes on a baking sheet and bake for 20 minutes. Turn and bake on the other side for an additional 15 minutes or until fries are browned and crisp. Recipe by Megan Ware, RDN, LD. Registered Dietitian Nutritionist in The Woodlands, TX.